Branson impressionist Mike Walker is the next guest on the “Gene Williams Country Music Television Show” to be telecast Oct. 3 and 4. “My friend Mike Walker has mastered over 150 different voices including presidents, actors, cartoon characters, and singers ranging from Johnny Cash, Ray Charles, Michael Jackson, and Michael Bolton. Mike has even mastered me! He is the only artist to perform on the Graceland estate. He’s a wonderful talent and a great guest. I am happy to have him return as my guest and taking time out from his busy schedule performing at the God and Country Theatre,” said Williams, the star and creator of the “Gene Williams Country TV Show” which was taped live in Branson, Mo., for the past eight years and recently was moved to be taped live in the NBC affiliate KY3 Studios in Springfield, Mo., and will continue to feature the shows and stars from Branson and country music. The 11th Annual Hollister Grape and Fall Festival, presented by the Hollister Area Chamber of Commerce and the City of Hollister, will be held on Saturday, September 26th from 10 am to 6 pm on Downing Street in Historic Downtown Hollister. The Grape and Fall Festival features great food, crafts, children’s activities, live music and entertainment from some of Branson’s best performers, a wine tasting garden, and the signature event—the world famous Grape Stomp competition sponsored by Branson Ridge Winery, where teams compete for the honor of winning the Ugly Monkey Trophy. The annual event is one of the most popular in the region, and attendance has exceeded 5,000 people in previous years. This year promises to be the most exciting and well-attended Grape and Fall Festival ever. The Grape Stomp competition is one of the most anticipated events of the year in Hollister. Stomping teams wear costumes and choreograph their two-minute routine, while toga-clad local elected officials, like Taney County Presiding Commissioner Chuck Pennell and Hollister Mayor David Tate judge their efforts. This year, five teams will be competing for the honor. Our local dignitaries are above reproach, but during the Grape Stomp competition, the teams are encouraged to win the judge’s favor with baked goods, pies, and other treats. The Grape and Fall Festival is a celebration of Hollister’s 100 year history. In the early days, Hollister was an important stop on the railroad, and autumn was the time of year when people brought agricultural products and other goods to Hollister for transportation to larger markets. 2010 is Hollister’s Centennial, and there are plenty of events being planned to usher in this important milestone in Hollister’s History. Registration for the bike ride begins at 7:30 am, and the riders will leave from Chad A. Fuqua Memorial Park in Downtown Hollister at 8:00. This 12 mile fun-ride will go through Hollister to Branson Creek and back. Food, crafts, and live music from some of the area’s best groups on Historic Downing Street in Downtown Hollister. Kids activities and fun for everyone. Teams compete for the Ugly Monkey Trophy by winning the judges’ favor in this hilarious and entertaining event. Contestants are up to their knees in grapes. For more information on the Hollister Grape & Fall Festival call 417.334.3050 or contact the Branson Tourism Center, one of Branson’s largest and most respected vacation planning services and sellers of Branson show and attraction tickets and lodging. BTC can be reached by calling 800- 785-1550 or through its website www.BransonTourismCenter.com. Branson, MO – (Friday, September 18, 2009) – Saturday, October 3, 2009 will be there night to “Party with The Stars”. The party begins at 9:00pm at the Chateau on the Lake Resort. The League of Branson Theatre Owners & Show Producers (The Branson Show League) and Branson.com invite the public and everyone who lives and/or works in Taney or Stone County to join us as we “Celebrate 50 Years of Live Music Shows”… and the people who made it all possible! Jeanie Horton, Legends In Concert General Manager and President of the Branson Show League said, “This is a party for all of us…from the show that started it all to the housekeeping staff that makes sure our visitors have a comfortable stay. It’s more than just celebrating 50 years of shows; it’s about celebrating the people who really make Branson what it is.” For complete details go to www.PartyWithTheStars.com. Party events include live band, hors d’oeuvres, red carpet event hosted by Branson’s own Joan Rivers (aka Terry Sanders), silent auction, wall of fame, special presentations, appearances from Branson favorites, cash beverage bar, and games including Branson-style Karaoke, Dance Contest, Guitar Hero competitions, and more. “We’re all planning on kicking back and enjoying a party where can have fun with each other. We’ve got a live band and a dance floor, so plan on kicking up your heels,” says Michael Horn, Circle B Show and Branson Show League board member. In order to cover the costs for the party there will be an admission price. For those living and/or working in Taney or Stone County a party ticket is $15 at the door. HOWEVER, you can purchase your tickets now from Branson.com for only $9.95 per person. (General admission is $29.99). With your ticket you’ll receive a special Party with The Stars Souvenir Book along with a great evening of Ozarks fun! Purchase your tickets by going to www.PartyWithTheStars.com. AN EVENING FULL OF STARS, GREAT MUSIC AND FIREWORKS AT BRANSON LANDING! BRANSON, MO – September 22, 2009 – Branson Landing is tremendously excited to announce their Concert Series Grand Finale Event for the 2009 Season – kicking off at 8:00 PM on Friday, September 25th. The local community and visitors are invited to join us in Branson Landing’s Town Square for an evening full of Stars, Great Music and Fireworks! The evening’s events will include an entertainment lineup showcasing some of the amazing STARS located right here in Branson, MO, featuring Clay Cooper & Clay Cooper’s Country Music Express with Special Guest Star performances by Collin Raye, Barbara Fairchild, Roy Rogers, Jr., The World Famous Platters and the Liverpool Legends. proud to showcase some of the amazing talent and STARS we have right here in Branson, on our stage that evening – right in front of the Branson Landing Fountains,” said Scholten. general public. We look forward to our time in Branson and we hope to delight the community with amazing, memorable fireworks that leave a lasting impression for all! Please join us and see what the premier trade association of the fireworks industry, APA, has to offer,” said Heckman. This unforgettable fireworks display will include a “close proximity” rooftop display and more, all choreographed to a lively “gaming” theme with a grand finale on the waterfront – fired from a barge on Lake Taneycomo, featuring a tribute to “Beatles Love” – followed by an unforgettable LIVE performance from the Liverpool Legends. “All of the entertainment and fireworks displays will be near the Landing’s signature Fountains and this one-of-a-kind choreographed show is sure to WOW both young and young-at-heart, as it builds to an awe-inspiring Gateway Fireworks Signature Grand Finale on the waterfront – not soon to be forgotten,” concluded Scholten. Mark your calendars and be sure to be at Branson Landing for this Grand Finale Evening full of Stars, Music and Fireworks – Friday, September 25th. For additional information on the September 25th Concert and Guest Stars performing, please visit the Branson Landing website at www.bransonlanding.com. Branson Entertainment “Diamond” & Medical Clinic Team Up for One Day to Raise Funds & Awareness for A New Free Medical Clinic of the Ozarks located in Branson. Branson’s Neil Diamond Tribute Artist, Keith Allynn, will be hosting a Local Area Appreciation for his show, appropriately named, “A Neil Diamond Tribute”, Sunday, September 27th, 2009 at 5:00 pm. The Show is Free to Stone, Taney, Christian & Green County Residents with a donation for the New Free Medical Clinic of the Ozarks. The Clinic is a free, nondenominational faith-based medical facility for people who have no medical insurance. The clinic opened on November 11, 2008 and is currently opened Monday, Tuesday and Thursday nights between 6 and 9 pm to see patients by appointment. Monday night clinics are specialty clinics for orthopedics, gynecology, pediatric and respiratory patients. Since November, over 600 patients have been helped. Each person sees a physician or nurse practitioner and receives their medical care and necessary medicines at no cost. Each person also has a visit with a trained lay chaplain who presents the gospel to everyone and prays with each patient for their specific needs. Everyone serving at the clinic volunteers their time and talents. There are no paid employees. The volunteers include 21 doctors, 40 nurses, 16 lay chaplains and over 30 lay volunteers. Expenses of the clinic include monthly rental of the office, utilities and cost of generic drugs purchased from Lakeland and Wal-Mart Pharmacies. All of the clinic equipment and supplies have been donated. Skaggs Hospital has been an integral part of our services by providing a paperless system and IT person to maintain all medical records through the clinic. As well as free lab and x-rays, which alone is an invaluable resource and cost savings to the patient and the clinic. A Prescription Program for long term prescription needs is also in place for patients with Diabetes, Heart Disease, etc. Many drug companies have a free prescription plan available, but the hoops can be confusing and time consuming for patients. At the clinic a nurse assists patients in jumping through those hoops making the assistance quicker to receive. Keith Allynn, known to fans as “The Diamond Image”, due to his close look & sound to Neil, is excited about raising both funds and public awareness for the Free Clinic. His show opened in late June at the Hall of Fame Theater in the Branson Mall, located next to Wal-Mart on Hwy 76. His “Diamond Style” show is a 70 minute concert which tells the story of Neil’s life, (and some of Keith’s Life), through Neil’s songs. Favorites include, Cherry, Cherry, America, Play Me, Craklin’ Rosie and You Don’t Bring Me Flowers, (a duet which featuring Allynn’s wife, Diana Lynn) to name a few. 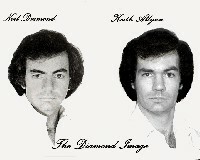 A Neil Diamond Tribute normally plays Tuesday – Saturday at 1:00 pm. This encore performance on Sunday, September 27th at 5:00 pm is for the area appreciation and filming of Allynn’s first DVD release. Many area entertainers and surprise guests will be in attendance. Allynn will end his first season on December 11th. Doors open at 4:00 pm with general admission seating. Staff of the Clinic will be on hand to accept donations and provide information on becoming a volunteer or a patient. 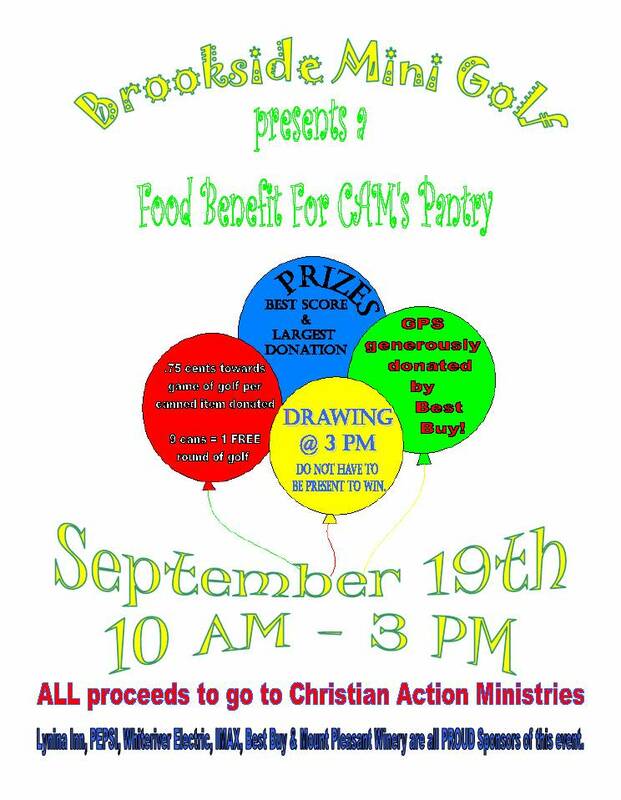 Mini golf, drawings, and prizes all to benefit CAM’s Pantry. .75 cents towards game of golf per canned item donated. 9 cans = 1 free round of golf. 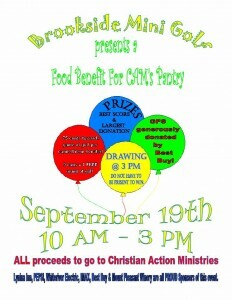 September 19th from 10 AM – 3 PM. Drawing at 3 PM (Do not have to be present to win). GPS generously donated by Best Buy. All proceeds to go to Christian Action Ministries. Lynina Inn, PEPSI, Whiteriver Electric, IMAX, Best Buy, & Mount Pleasant Winery are all PROUD Sponsors of this event. Titanic will shroud itself in myth and legends for the first Halloween Masquerade progressive dinner party. In keeping with the spirit of the evening all crew members will wear decorated Vienna masks. During the progressive dinner Titanic crew members will reveal strange tales and unexplainable phenomena that haunt the Titanic to this day. Reservations are required. Group rates available to parties of 15 or more. Factory Merchants Branson invites teachers and all school employees to visit the Center Management Office located in building 10 for additional savings and refreshments. The first 25 individuals to show their school ID will receive a free gift bag. Factory Merchants Branson offers shoppers name-brand outlets and specialty stores offering savings of 25% to 65% every day. Stores include Carter’s, Dressbarn, Dressbarn Woman, Easy Spirit, Fuller Brush, Izod, Jones New York, Lane Bryant Outlet, Limited Editions For Her, Pendleton, Reebok, Van Heusen, and more. The center is located on Pat Nash Drive, just off Hwy 76, or from Hwy 65, take exit 248 to Gretna Road. For even greater savings, join the free online VIP Shopper Club. For more information or a complete listing of stores, please visit our website at www.bransonoutlets.com. Factory Merchants Branson is located in the heart of Branson. Just look for the red roofs! We are proud to announce that Mount Pleasant Winery in Branson has partnered with the Branson Arts Council to display the works of talented Missouri artists in our winery. We invite you to “Meet the Artist” on Friday, September 18th from 5pm to 7pm as we toast Missouri artist Jim Rodgers. Wine and cheese will be served. Admission is free. Mr. Rodgers is an award-winning artist. He portrays a variety of subjects with his acrylic and oil paintings, such as wine and cheese, fruits and vegetables, landscapes, portraits and even the Branson Belle! Mr. Rodger’s work will be on display at Mount Pleasant Winery in Branson for six weeks. Most of the art will be available for sale. In partnership with the Branson Arts Council, we will announce a new artist every six weeks with a wine and cheese reception. Please join us for our first “Meet the Artist” event this Friday. The Branson Arts Council announces the second annual TOUR OF KITCHENS to take place Sunday, October 4, 2009, from Noon to 6P.M. In conjunction with the kitchens tour the BAC is again featuring COOK’S CHOICE cookbook. The TOUR OF KITCHENS includes the homes of Rodger and Becky Smith which features beautiful art and artifacts, Ann and Shelby Wright whose home is decorated in an English manner style. Bill and Gail Lennon’s home is very eclectic and the Tuscan home is Earl and Nancy Apprill’s. There will also be a condo at Branson Landing(all of which are in the immediate Branson area). Signage have again been contributed by Loann Barter,Realtor. The three-ring COOK’S CHOICE cookbook features a unique hard cover design by local cartoonist John Logan and includes recipes from local chefs, restaurants and entertainers as well as a unique, self-contained cookbook stand. The COOK’S CHOICE is designed to become a collectors item and will be available for sale during the tour for only $20. Several of the homes will offer refreshments and new this year will be a chef doing demonstrations at the Apprill home. and Visa and MasterCard are accepted. The proceeds from the fund raiser are used for children’s, adult and public programming of the Branson Arts Council.